The title of this work refers to the seventeenth-century English physicist Sir Isaac Newton, who discovered that the light of the sun is composed of the seven colors of the spectrum: red, orange, yellow, green, blue, indigo, and violet. Kupka’s radiant composition incorporates circular bands of vibrating color, including the full range of the spectrum as well as white. When the Czech painter Kupka exhibited his purely abstract paintings at the 1912 Salon d'Automne in Paris, the French critics were enraged. The blazing colors and cosmic symbolism of works such as Disks of Newton were seen as a blatant challenge to French taste and tradition. The title refers to the seventeenth-century English physicist Sir Isaac Newton, who discovered that the light of the sun is made up of the seven colors of the spectrum: red, orange, yellow, green, blue, indigo, and violet. Newton expressed the mixing of these colors in the form of a disk, or a color wheel, which showed that if two different colors of the spectrum are combined, they produce a third color, and if all seven colors are mixed optically, they produce white. 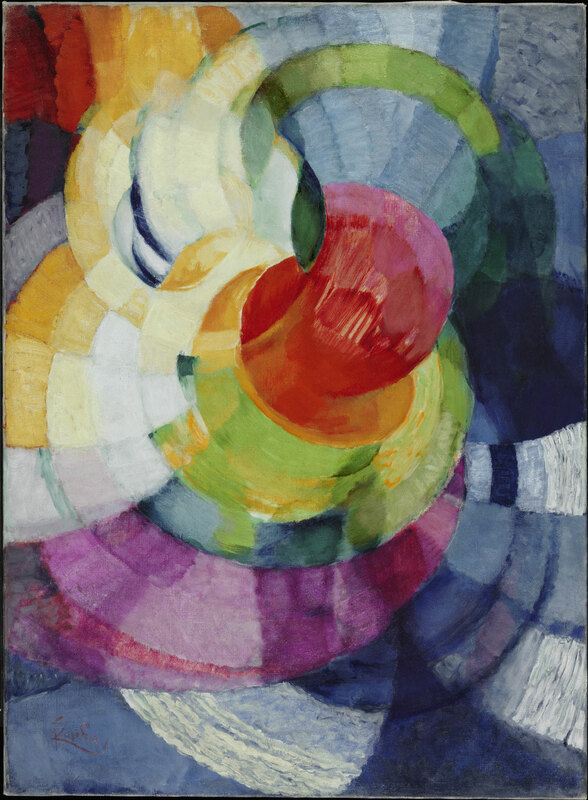 Kupka's radiant composition uses Newton's scientific discoveries by incorporating circular bands of expanding concentric rings of burning, vibrating color, including the full range of the spectrum, along with white. The forms overlap and interpenetrate each other to produce an exciting sense of spinning movement. The artist's fascination with cosmology and astronomy suggests that the circular blades of color whirling out from the red center may relate to images of the planets and their orbits. Another analogy is demonstrated by the word fugue in the second half of the title, which evokes the polyphonic interweaving in musical arrangements of Johann Sebastian Bach. Kupka believed that painting should be as abstract as music, declaring: "I can find something between sight and hearing and I can produce a fugue in colors as Bach has done in music." 1 Twentieth Century Painting and Sculpture in the Philadelphia Museum of Art (2000), p. 24. 1) W. Warshawsky, "Orpheism, Latest of Painting Cults," The New York Times, October 19, 1913, p. 4; quoted in František Kupka, 1871–1957: A Retrospective (New York: The Solomon R. Guggenheim Foundation, 1975), p. 31. Collection of the artist, Paris, as of 1936; sold to Louise and Walter C. Arensberg, Los Angeles, through Marcel Duchamp as agent, 1937 ; gift to PMA, 1950. 1. See letter from Arensberg to Duchamp dated Oct. 27, 1937: "We have had notice that the Kupka has arrived". Duchamp's provenance notes dated September 8, 1951 (PMA, Arensberg Archives), record that the painting came from the Kupka's collection (although he was off by two years on the date of the sale, which he gives as 1939).